"Naturally, all passenger and cargo ships sailing the Baltic Sea fulfill the environmental requirements currently in force," head of the port company's department for quality and environmental management Ellen Kaasik was quoted in a press release as saying. "As a port, with this discount on tonnage fees, we wish to encourage shipping companies to further contribute to sustainable solutions and thus to protecting the sensitive ecosystem of the Baltic Sea." Port fees are differentiated based on the Environmental Ship Index, which is calculated according to a ship's volume of emissions, energy saving program and capacity to use shore power. "Approximately 50 ports around the world use the ESI in calculating port fees, including our nearest neighbor Helsinki and the largest ports in Europe -- Rotterdam, Antwerp, Hamburg and many others," board member of Tallinna Sadam Margus Vihman said. 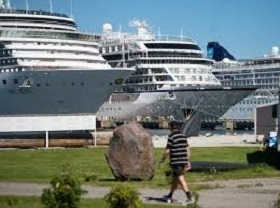 "The higher the number of ports on a shipping route that reward [ships] for environmentally sustainable solutions, the more motivation shipping companies have to implement innovative and sustainable solutions -- the monetary value of the discount from the Port of Tallinn alone can reach tens and even hundreds of thousands of euros per year," Vihman added. Ships with an Environmental Ship Index over 80 receive a discount of 8% on tonnage fees at Tallinna Sadam, while ships with an index of 65-79.9 get a discount of 3%. "To receive a discount on tonnage fees, a ship has to have joined the ESI; the number of such ships in the world today is over 8,000 already," Kaasik said. The Environmental Ship Index was developed in the framework of the World Ports Sustainability Program. Today, ESI, which is used in many ports in the European Union, as well as in Norway, is becoming the main energy label with which ports motivate ship owners to use environmentally friendly ships and technologies and reward them for doing so. Tallinna Sadam first implemented the system of differentiated port fees based on sustainability in 2014, by providing a discount on waste charges to cruise ships which sort their waste.